Scratches and specks: Select the area with imperfections and use the Dust & Scratches dialog box (if your image editor has one) to remove them. The Airbrush tool works wonders when you’re restoring photographs. It gives you a soft edge that blends with the original photo and also adds color with a degree of transparency that looks more natural and less like a patch. 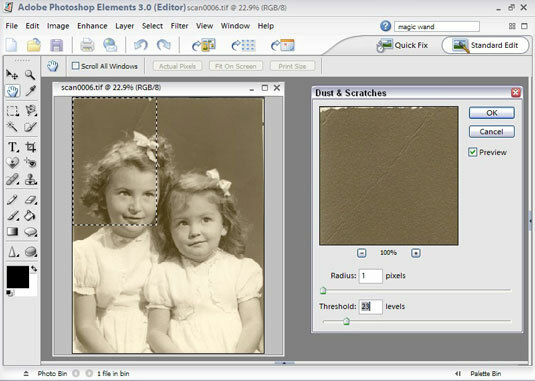 Remove imperfections in your image by using the Dust & Scratches dialog box. Spots and damaged areas: View the picture at its actual size, then use the Clone Stamp tool (or your image-editing program’s equivalent tool) to copy an undamaged portion of the image and cover over the damaged area. 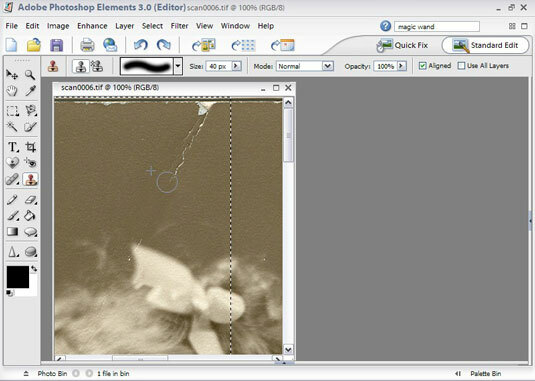 Use the Clone Stamp tool to clean up a tear in your scanned photo. Touch-ups: Use the Airbrush tool (though your image-editing program may call it something else) to paint over damaged areas. Avoid adding more specks to your scanned photo by cleaning the scanner window with an ammonia-based window cleaner and dusting your photos with a soft brush or cloth before scanning them.